I feel should explain your recent drop in sales in the KC Metro area. It all started innocently enough after college when I started working in the real world for the “man”. I had an early East coast territory and each morning it was a struggle to be chipper, attentive, productive and resilient against the no’s. They started everyday around 7am and that was hard for me. So I medicated. I mean drank the magically caffeinated beverage of Diet Coke. One was never enough, so every few hours I would wander across to the break room with my jingling change. I would feed the magical machine my 50 cents. Ah…I can hear the can dropping down to me still. Then my drawer was soon emptied of coins and then I would scavenge through my car and ask friends if I could borrow from them. Not pretty. I knew I had to do something. So logically, I started packing in my own 12 pack for the office fridge and I would have extra ones under my cubicle desk. This went on for years. I was kind enough to share from time to time with co-workers and friends. And when we would go out for lunch, I would drain two to three refills of the delicious caramel colored liquid without even thinking about it. Ah… The fizzy bubbles. But just recently I have decided I am worth more than what I have been consuming. It just can’t be good to be pouring artificial, yet delicious gunk in me each day. Surely I can kick this habit. I feel like I am over the hardest part and now I have the confidence to walk away. My Dad has a saying that I hear often. It is, “better living through chemistry.” He says in tongue in cheek, because he is sure that we all have gotten into such a made for us kind of world that we are missing the good stuff. I am going to start getting away from this type of living. It can’t be what fuels me anymore. So dear Local Coca-Cola Distributor please take note. After years of only choosing restaurants if they carried your brand of soft drinks, I am parting ways. There I admit it. Whew. Of course, water will be the best choice for me. And switching hasn’t been too bad. And this change will be a help to our bottom line in two ways. $1,944.00 spent on Diet Coke !!!!!!!!!!!!!! I’m pretty sure that Diet Coke has zero calories, BUT it tastes best with things that are salty, sugary and juicy, which have a gazillion calories!!!!!!! Hoping that this helps my overall health and helps me focus on the temple God gave me. So thank you for your faithful service and stocking of Diet Coke to help fuel my days and wake me up. I no longer will be needing your services. Looking forward to a soda free me from now on. I am joining my sweet husband in his refusal of sodas in his diet. He gave them up 7 years ago for Lent. Guess it is true that no one can make you change until you are ready. But I am ready now!!!! But when I make cookies for my kids I have to now fight one of the most primal, unconscious, life-long acts of my existence. I am a fan of raw cookie dough. GASP! I would guess you have sampled it before as well. But I am brave enough to confess it! I know I am not alone because the supporting evidence is in each grocery store… cookie dough ice cream and candy. And of course ice cream and custard shops! It was naughty, it was impatient, and delicious. Now I read warnings as I dip dough from our jumbo Nestle Toll House tub from Costco. Unkind warnings. And I know in my rational brain I need to heed their solemn advice. They became more significant when I caught a new story a couple of years ago about at a very sick woman in Las Vegas. She had eaten raw cookie dough that had E.coli. (see story link below) Her reaction was so severe and it made a lasting impression on me. I stopped cold turkey. So I get it. Doesn’t make me very happy. And of course my life will go on. I am changing the next generation though because my children would never consider eating raw cookie dough. So there! New Story on E. coli. 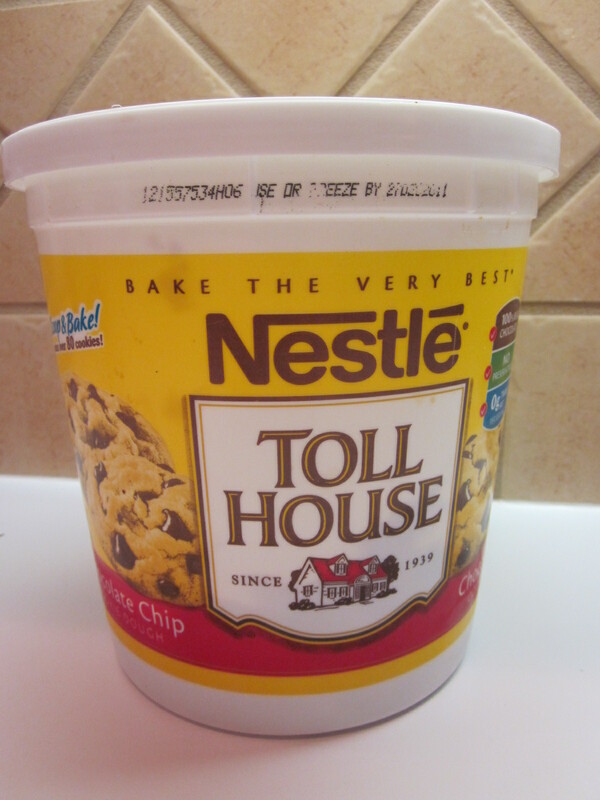 Entire tub of cookies is 9720 calories!!!!!!!!!!!!!!!!!! !